August 30, 2002, Chuck Harp. Schinia tertia is a small (FW length 11 - 13 mm) moth with a brown forewing with a complex pattern on the distal wing, including metallic blue-black scales in the reniform spot, and a pale median line that flies in southern Idaho during late summer. The median area medial to the median line is pale tan off-white. The rest of the wing is brown, lightest at the base of the wing and variable brown or tan between the median line and postmedial line. The basal line is faint gray and light tan, evident only on the costa. The antemedial line is black, double with strong medial and weak lateral components, filled with the pale color of the adjacent median area. This line is undulating, nearly straight across the wing with slight indentations toward the base near the costa and trailing margin. The median line is gray-brown. The postmedial line has black lateral and gray medial components and is filled with pale tan or brown. The black component is often broken into spots on the posterior wing. This line is drawn sharply toward the base at the costa, broadly convex around the end of the cell, and slightly oblique toward the base below the reniform spot. The postmedial line is pale tan, jagged, and continuous across the wing. The terminal line is a series of dark spots. The fringe is tan, weakly to moderately checkered with dark brown or gray at the edge. The orbicular spot is gray, faint and often incomplete, with peripheral filling of the adjacent pale tan color and a gray central ocellus. The reniform spot is black, filled with metallic blue-black scales. 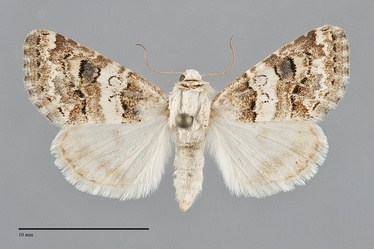 The claviform spot is absent or thin and gray with filling of the adjacent pale tan. The hindwing is tan off-white with a pale brown-gray discal spot, incomplete postmedial line, submarginal band, and dark thin terminal line. 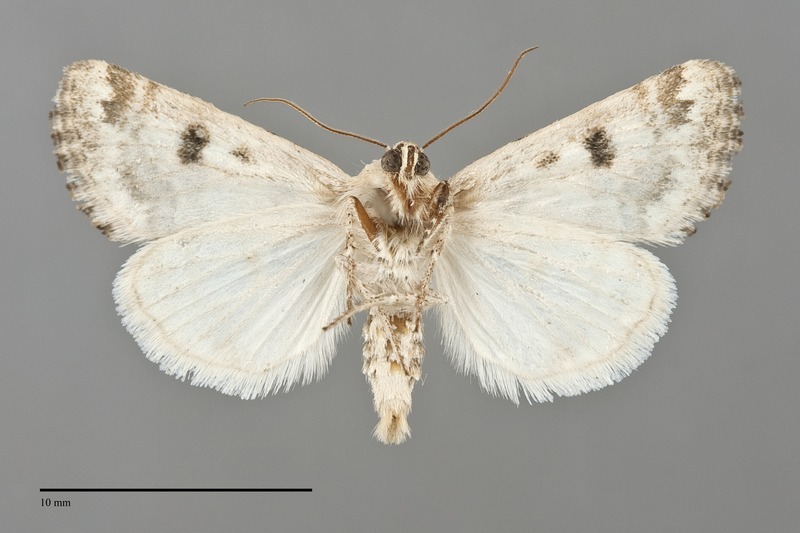 The hindwing fringe is white with a pale tan base. The head and thorax are very pale gray-tan. The male antenna is filiform. This species can be identified by its brown forewing with a complex, almost lace-like, pattern on the distal wing, the relatively narrow pale inner median area, metallic scales in the reniform spot, and pale hindwing discal spot. The most similar species in our area is Schinia albafascia in which the entire median area is white and the hindwing has a large black discal spot. 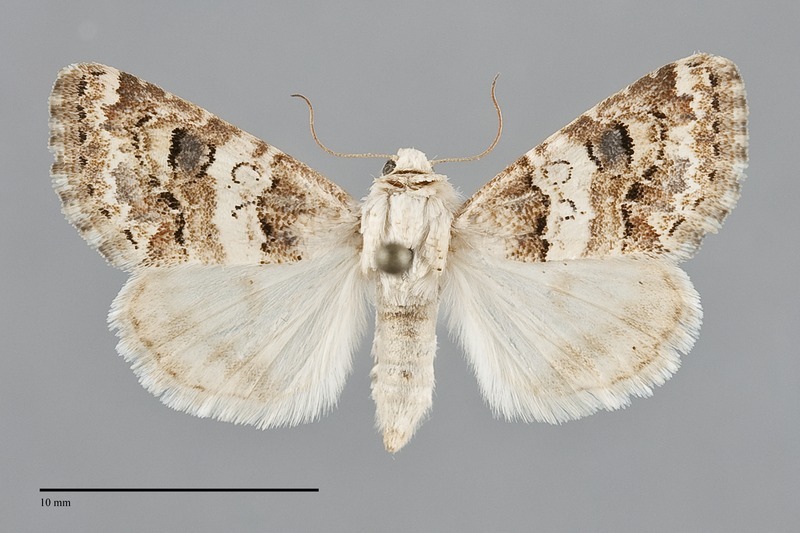 Tarache areli, a member of the subfamily Acontiinae, has a metallic reniform spot and brown distal forewing. 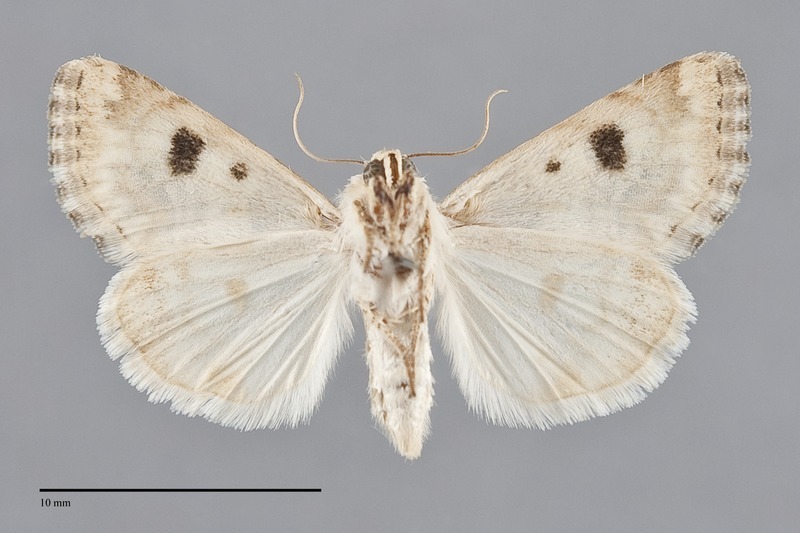 The entire wing base of this species is pale tan off-white, not brown medial to the antemedial line as in S. tertia. Schinia tertia flies in dry grasslands in the Pacific Northwest. It is common in this habitat in southern Idaho. 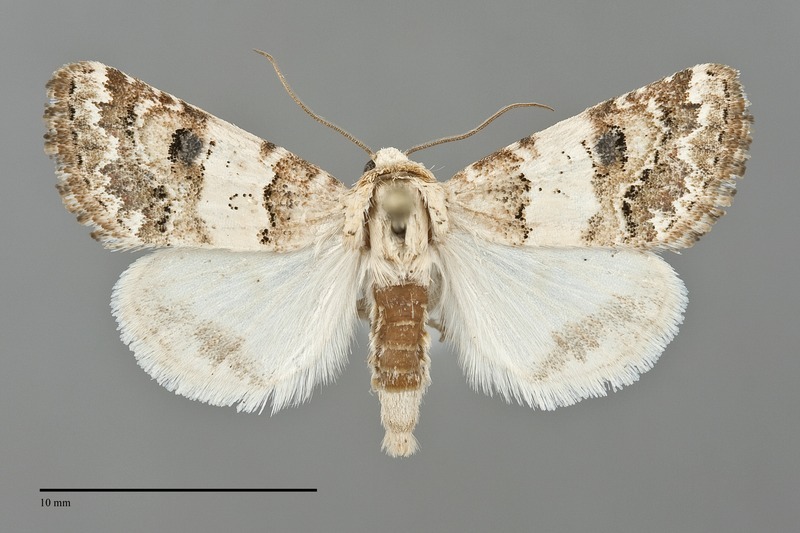 This species has been collected in southern Idaho near the border with Utah. The distribution of S. tertia forms a band across the Southwest from California to the eastern Great Plains. It also occurs slightly further north to Nebraska, Wisconsin, and northern Illinois. No information is presently available regarding larval foodplants of this species. It is associated with blazing star (Liatris spp., Asteraceae) in parts of the Great Plains (Pogue and Harp 2004). An unknown host must be used west of the Rocky Mountains since Liatris does not grow in this region. This species flies during late summer in the Northwest, with most records from late August. It is nocturnal and comes readily to lights.